"I could not have finished my high school without your financial support"
The Rotary Club of Tamar Sunrise has been supporting the Basa Elementary School in the district of Trento in the Philippines for a number of years. There are now nineteen students who have been supported through this program. This support includes awarding of scholarships to students to enable them to further their education at the Trento National High School. Students to be awarded scholarships are selected by the Head Teacher at the Basa Elementary School. Selection is based on grades, endeavour and the desire to complete their education. This ensures that scholarships are awarded to children with both the potential and desire to learn. Each child is supported for the four years of their secondary education. 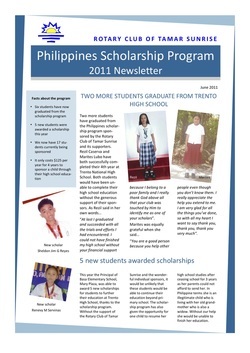 The scholarship covers essential educational expenses such as school supplies, uniform and travel. Expenses are verified by the Club. $125 per year for four years is all it takes to support a student through their secondary education. The Rotary Club of Tamar Sunrise express our sincere thanks to the individual sponsors who help to support this program.